Aprilia’s new Tuono V4 R APRC has genuine superbike performance, advanced electronic rider aids, a MotoGP soundtrack and a real-world, roomy riding position. 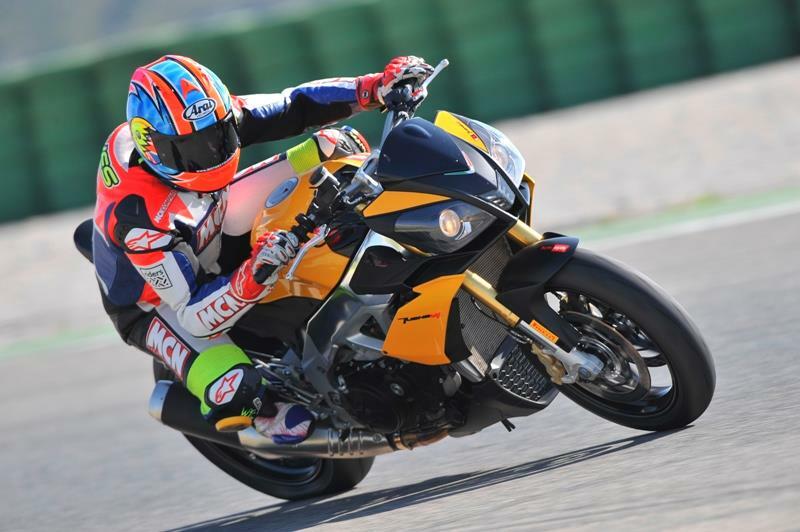 Could this be the ultimate real-world superbike? Producing a claimed 167bhp, it’s more powerful than its closest super naked rivals, like the Ducati Streetfighter, KTM 990 Super Duke and Triumph Speed Triple. It’s a serious weapon on the track thanks to its balanced chassis, strong brakes, powerful engine, quickshifter, traction control and anti-wheelie. On the road it’s loads of fun when you turn the anti-wheelie off and setting the traction control high to deal with the unexpected, is a useful safety feature. You can be the first away from the traffic light GP too, if you use the electronic launch control. With a wide spread of smooth power and an impeccable throttle response it’s far less brutal then the V-twin Tuono of old. It’s also available without the APRC package for a grand less. 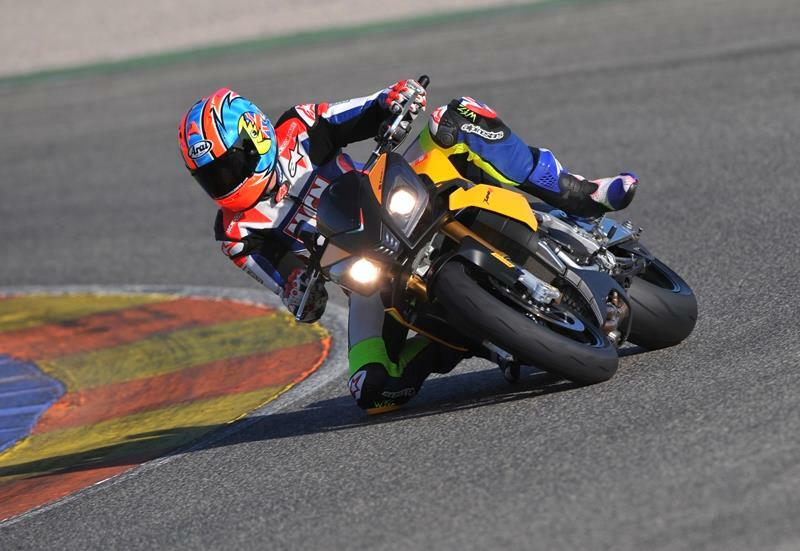 Handling and braking on-track is as good as any superbike and it’s impressively stable for a super naked machine with high handlebars, thanks to its superb chassis set-up and anti-wheelie control. It’s the same confidence-inspiring story on the road and your body isn’t contorted into a race crouch, like on a superbike. The seat is very hard, though and becomes a pain within an hour’s riding. The Tuono uses the same compact 65° V4 engine as the RSV4 superbike, but tweaked slightly to make it friendlier for road riding. Claimed power is 167bhp@11,500rpm and there’s 82ftlb of torque at 9500rpm. The rev limit is set at 12,300rpm. 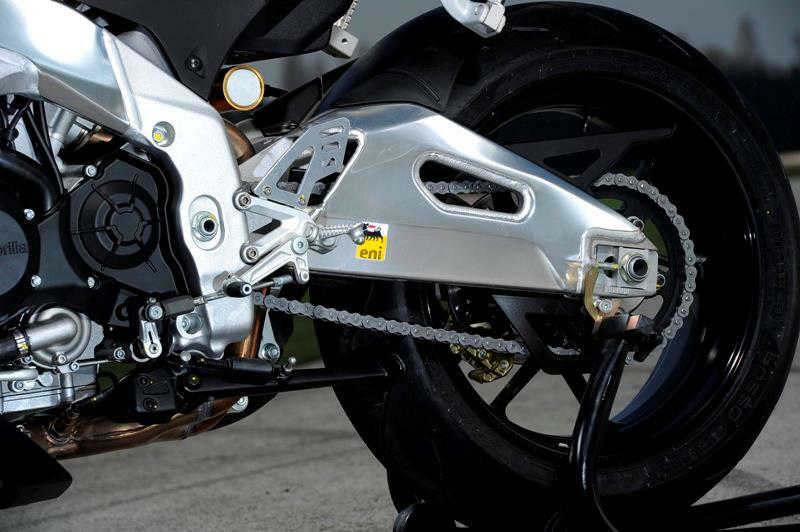 Compared to the RSV4, the motor has new valve timing, 20mm longer fixed intake trumpets (opposed to electronically-operated in the superbike) and a heavier flywheel. The first three ratios in the cassette gearbox are shorter and it still has a slipper clutch. The motor is soft and friendly at low revs, builds strongly in the midrange and explodes into an arm-wrenching frenzy at high rpm. It’s fabulous. Both the APRC and non-APRC versions have three power maps to choose from: T (track), S (sport) and R (road). 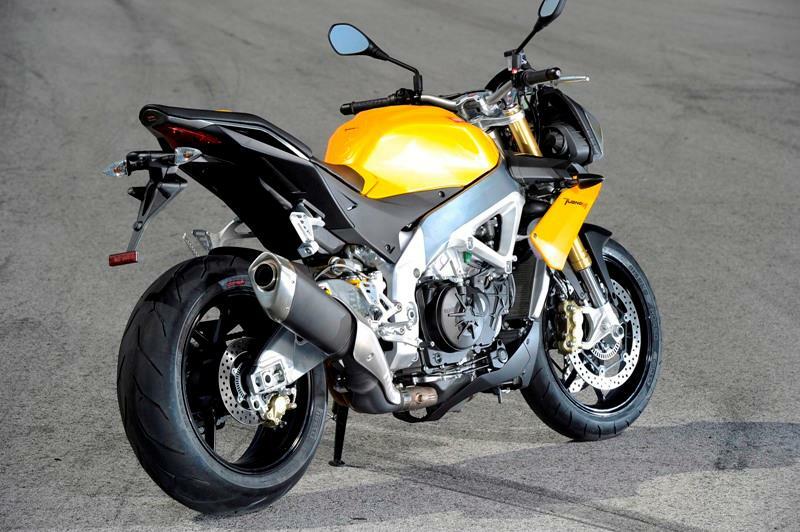 The Tuono is superbly built, has robust paintwork and a polished frame and swingarm. Reliability should be top notch too. When you consider how much the price of Japanese machinery has increased over the past few years, the Tuono V4 R look like the bargain of the century, especially when you consider its high performance and level of equipment. Plump for the APRC (Aprilia Performance Ride Control) version and you get anti-wheelie, launch and traction control and a quickshifter. That’s on top of a beautifully-crafted aluminium frame and swingarm, fully-adjustable Sachs suspension, Brembo brakes and a switchable display (road/race) LCD dash. You get an amazing amount of equipment for your money. 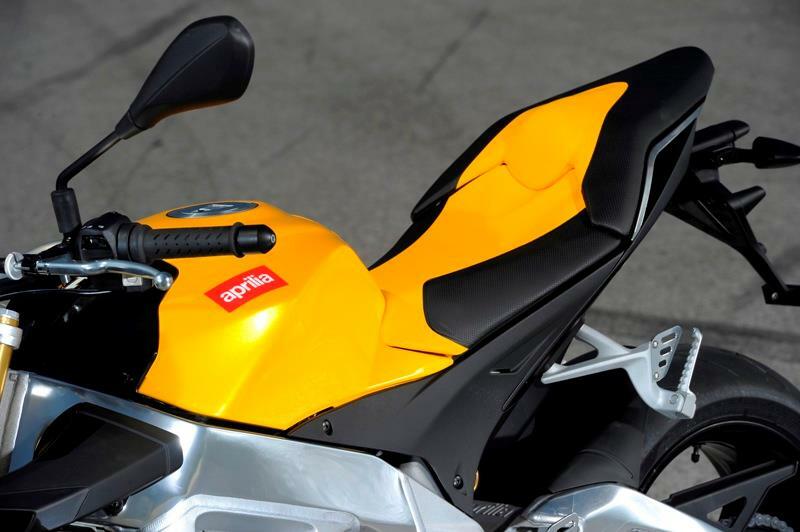 17 owners have reviewed their APRILIA TUONO V4R (2011-on) and rated it in a number of areas. Read what they have to say and what they like and dislike about the bike below. Great engine and electronic toys but real pity about reliability and fuel economy. Fork seals gone after 11000kms. Valve clearances naffed at 10000km. Electronics went walkabout after decent ride at 9000k. Too much time in the shop has ruined the love affair. Paying to get stuff fixed annoying too. Pity. Doesn't do much to change the stereotypical Italian quality jokes. $500 is a lot! Drinks like a sailor on shore leave. Apart from that the actual bike was good value for what it does and how much other premium brands cost...not to mention what the Japanese cost now (although you do get quality with them). This bike covers all bases, swapped a Fireblade in for this bike and it does not disappoint, the power and torque is unbelievable, engine braking is so so good you hardly need the brakes, no chicken strips on this bike it handles superbly, electronics are amazing and give you so much confidence.very thirsty however only about 100 miles to the tank but well worth it, sound form stock exhaust is also great, not found any negatives a as of yet . This bikes managed to put me back where I was 25 years ago: like a child drooling for an ice cream on a hot and boring Sunday at the coast. As a former "Ducati man", Aprilia was the bike for the biking Johnnies to me. Well, this Tuono Buono changed my opinion, ladies! It's a rocket with a parachute. This things puts you on a permanent roller coaster. Makes you regret you didn't go for the RSV4 :-) It's thirsty on fuel. You don't order a call girl to negotiate her rates, do you? My ex Duc 1098 was a lean and mean racing machine and the Kawa ZX10R was ...another one, but if you're getting a tiny bit older and want to commute without a daily wrist massage (without happy end! ), this is thé thing! Mean an low turns behind high handle bars are still not my thing unfortunately... I'll buy this bloody RSV4 too! Chuck Berry on fire in the ears, accelarations that make you fear for your fillings and even willing to commute! Never thought a bike could be so versatile without being dull like a ...Honda? It's like a 22 years old beauty, with brains. So far so good. Some kling-klang noises in the engine (when shifting down) remind me not everything is plastic on this thing, As long as nobody's leaving the ship, it's all good. Starts nicely without a morning mood and there's no shame to show off at the terrace of your favorite pub. That's when you realize more friends had an idea of investing in Aprilia btw. The finishing touch is not at Ducati or MV Agusta level, but who cares? A good character is so much nicer than great looks (noooot). Second hand remains the best way to get a great value for your pesetas ;-) Buying this new seems expensive for a naked, even for a diabolic naked. Problem is this type of bikes remain a compromise. And I don't compromise over 10 000€ ! The 3 riding modules and 8 traction control levels supposed to make you believe you're such a "crazy" rider you'll need them, seem idiot proove. Even I managed to understand it. THAT's hard evidence! Second hand after 2 years. Bike had 1 350km. That's less than half the new price. If it appears it was not stolen, I'm a lucky buyer and there is a not so happy seller. Fabulous real world super bike performance. racing technology. racing costs... ie fuel. Overall quality is good. however don't think its up to Ducati standards even pre Audi purchase time...plastic air housing looks really cheap and castings and fixings don't look as good as Ducati. although probably in fairness at least on par with Japanese alternatives. have had clutch cable snap. to be fair dealer advised may be through figment of cheap ebay aftermarket levers. also had oil leak front left hand side. only paid for 30 mins labour....plus point was clutch cable arrived in dealers day after ordered. Electronic nearly everything and adjust on the fly. excellent. Version : 2015 APRC Revised Version Monoblock Brembo 19L tank Revised fuel map comfier seat. 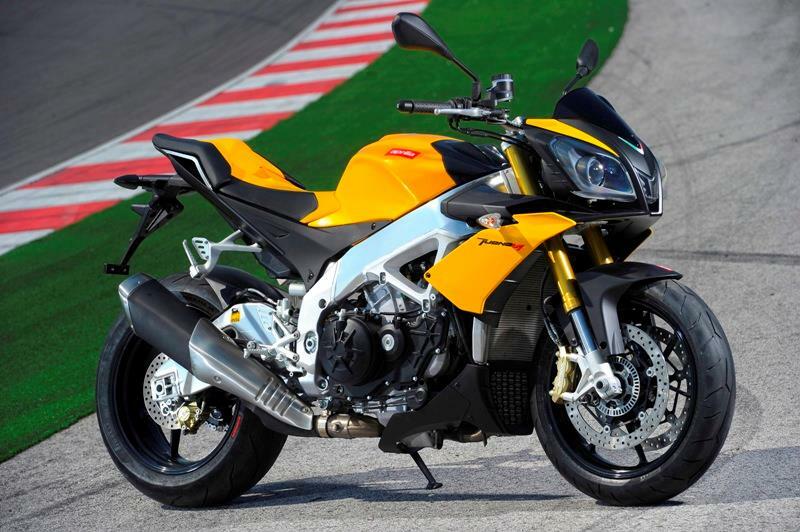 The 2014 model omitted from MCN review info was given a few tweaks fuel map, monoblock Brembo front calipers slightly larger tank, some electronic wizardry and a softer more comfy seat and was available in black or white. I love this bike its insanely quick and the noise it makes is addictive.The quickshifter is amazing it takes a bit getting used to keeping it wide open and changing up without the clutch but the way it works and the sound it makes is the shizzle! It's a hard bike to drive slowly not happy below 5k rpm, around town you spend most time in first gear which is good for 60+ mph, 30 in 2nd is just beyond piston slap. The handling is sublime quick turning and stable at speed. Can be difficult at low speeds as the turning circle is the same as a supersport but crank it up and its light and planted you can crack it wide open at any angle and the gadgets do their thang! The ride is firm even when set soft for road use but is never unsettled even over ragged potholed British roads. The brakes are immensely powerful and take a bit of getting used to the initial bite is weak but once it grabs it grabs hard and if the ABS is on full the lever is soon pulsing. You can brake a little mid bend without upsetting the bike and its amazingly easy to tighten or widen your line mid corner.Powering out of corners is like nothing else even on damp roads you can crack it wide open. I can ride for around three hours before the numb bum sets in as for pillions my one and only thus far described it as scary perched high behind me getting the full wind blast with the hand grips directly underneath them felt unsecure! Absolute beast if you red line in any gear you're going too fast! Best revved not happy just above tickover. I think its a beautiful looking bike and the quality of the components are great but its not as well put together as a Honda or Ducati the plastics feel flimsy and it does not all line up perfectly. The mirrors on mine fold in at high speed and when accelerating hard. No reliability issues as yet. Paint is great and the polished frame and swingarm adds class. Lots of bike for the money. Not cheap to service but why would it be with all the kit. It's a supernaked the only thing I'd like it does not have is fuel gauge no biggie! Good firm ride, well able to handle B roads, and excellent on "the twisties". The seat is comfortable enough on journeys up to two hours, I would not recommend the bike for touring or commuting, but this is not what the bike is about. I would not take a pillion rider on a journey out of choice!! Love all the "toys" will probably never test them to the limit, but extremely comforting to know they are there, suggest the minimum amount of intrusion according to skill and ability for the most satisfying riding experience. They seem complex on first encountering, but quickly become intuitive to a regular rider of the machine. Excellent service from the Aprilia Dealer in Peterborough, payed the asking price but received a full service and 2 new tyres as part of the deal, excellent PCP package meeting my request to gear the transaction to account for an annual change of vehicle. Please read on and you'll understand why it got a 3. Fantastic. Loved the bike when it was running. I'll give it a 2 because before it gave up the ghost the engine was great. Power delivery was spot on and mental enough to get you into trouble if you wanted to (and out if you needed to as well). It would have got 0 but that wasn't an option. 1 trip around Scotland and survived 1500 miles. Great first trip and loved the bike. Trip to across several countries to the Lakes in Italy and nearly back. Broke down with about 6000 miles on the clock. 4 months old! Engine intermittently high revving on its own, engine sounding like a bag of gravel. I am waiting to see what is actually wrong with it Needless to say this hasn't done a lot to reverse opinions about Italian bikes. Its still in warranty which is a good job otherwise I'd hate to think what value and running costs would be! Bought from a dealer I've used before. Can't fault them for the subsequent problems. Coolent leak and sometime wont start on hot start. I would describe this bike as the best bike i have owned. It handles and stops brilliantly, looks immense, aprc package is the best i have used, totally reliable and stonking v4 engine. I have owned the best Japan has to offer, but none have the character of this Italian gem. took one for a test ride and nearly didn't take it back...i wanted to try it on every back road I could find. A race can on the demo makes a sound to die for and the bike is almost everything any ageing sportsbike rider could want...speed, handling and upright but the seat is like a park bench so best avoid straight roads and make use of the sublime handling and its the easiest bike to move about on i've ever ridden. For me the default tyres aren't best suited to the UK....good tyre but too soft and moves about a lot. rode one on Monday simlpy awesome sound, midrange , top end , handling , everything ! I have owned 1098r , gsxr1000, ktm super duke and ridden everything else . The Apilia is outstanding and even comfortable( dont change the seat aprilia you will lose feel ) all I need to do now is convicen the missus the pillion seat is OK . Ii wont sell my gsxr100k5 but the gsx14 can go. If really necessary the gsxr can go too the Aprilia is that good!!!! I test drove the Aprillia Tuono V4 R APRC on Saturday afternoon courtesy of Jim Allen In Falkirk. I wanted to love this bike and buy it!! It ticked all the boxes for me the V4 engine the upright riding position. The acceleration the handling the race pedigree, the fully programmable controls and that amazing howl of the exhaust .... It just screamed, "BUY ME NOW!!!" The engine is just amazing, the handling is sublime and the road manners for a 160BHP bike are just incredible. However the seat is like a plank of wood - hard and seriously uncomfortable. I lasted just over 100 miles and could hardly walk after riding it. Aprillia - Please give it a better, more comfortable seat. I would also raise the handle bars by at least 50mm (2 inches) but that would be my personal preference. I hope Aprillia addresses these issues so that I can buy one next year!! Cause otherwise it is an truly awesome machine. You can believe all the hype about this bike, it really is that good to ride and the soundtrack is amazing. I can't see me selling mine anytime soon. I cant praise it enough !!! IF YOU DONT BUY THIS BIKE OR RIDE THIS BIKE THEN YOU HAVE NOT LIVED AND YOU MIGHT AS WELL BE DEAD. I have to shout about it because today june 4th Got this baby, it is so much fun, handles superb, drive superb,grin factor mega, and the sound will make you masterbate like crazy. this bike is so easy to control and backing it into corners is just stonking, so much feed back you can hang out on this. Sorry to the R1 rider who i blew away and left for dead, as he watched me back it inot the corners, and i was gone. what a track day tool this will be, but on the road it simply stunning. GET DOWN TO PALMERS MOTORCYCLES HEMEL HEMPSTEAD SEE JASON AND BUY BUY BUY!!!!!!!!! OMG have to go look at her again and knock one out. live long and enjoy riding. 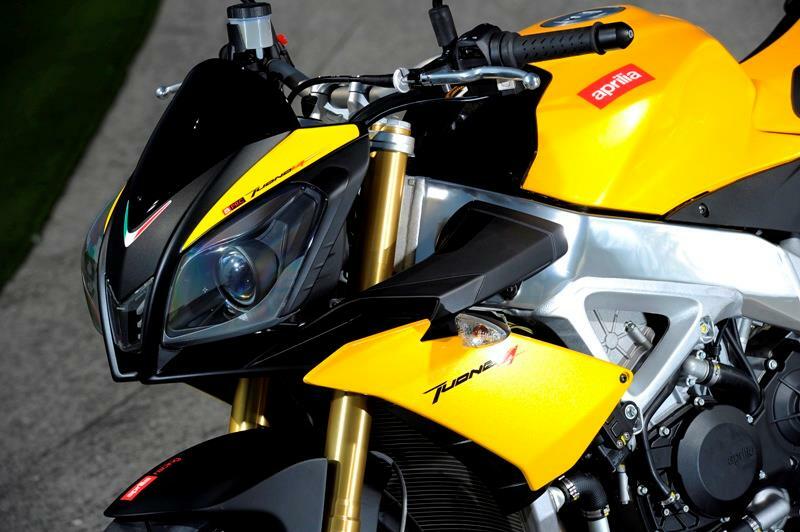 Aprilia Tuono V4R: "An astonishing all-rounder"
Video: What is the new 600?